Would you give away your real estate services for free? Of course not! So why are you giving away your knowledge, website content, and listing information? If you offer up all your listings, your blog content, and your educational material for free, you’re missing out on the chance to nurture that lead. Buyers and sellers browsing your site anonymously aren’t going to go out of their way to introduce themselves, you’ve got to make the first move and that’s where the lead capture form comes in. Keeping it short and sweet is key. Most often including name, email, and phone number is enough to get your started. The cold hard truth is that not every lead you get is ready to buy or sell at that very moment. Placing a form on your website to capture their information allows you to build rapport while they go through the research phase. Your end goal when you get a new lead is of course to close a deal, your immediate goal, however, is to nurture that relationship. If you are solely concerned about getting a deal from the get go, you’ll likely be labeled as “pushy,” or “salesy” and while consumers are in the market, they don’t like to feel like they are being pushed to complete a transaction. With lead capture and intelligent web design, you will be able to see certain types of homes a lead is looking at on your site and then make recommendations of other listings that are similar when they come up. Being able to see what your leads are interested in is a huge asset for you as an agent! It’s a way to start conversations. Of course, this needs to be done tactfully. You wouldn’t want to start off by saying “I’ve been watching your every move on my website,” that would be plain creepy. But if you can send an email saying, “A new listing has come on the market that I think you’ll love based on others you’ve liked,” now you are digging a bit deeper, opening up the conversation, and providing the lead with relevant content. Even if it’s not that listing that makes them pull the trigger, you are showing them that you know what they like and that you are willing to build a relationship with them. 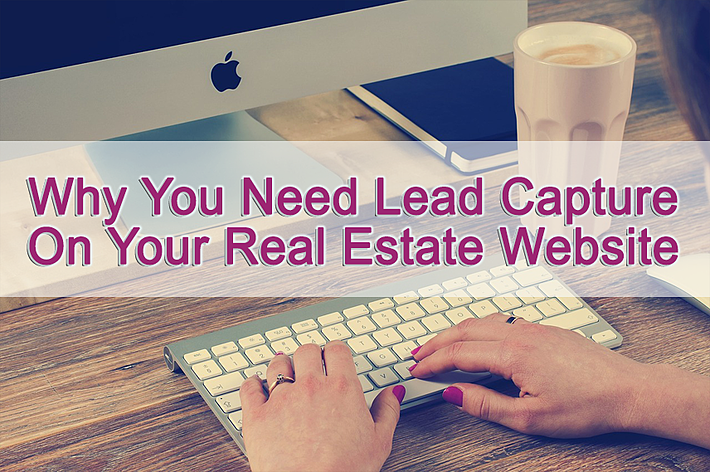 Did you know that most consumers fill out 8 to 9 different lead capture forms when they are looking at real estate? The trick is to be the first to respond. Buyers and sellers aren’t actively looking for real estate agents online. They are looking for real estate. Your job is to provide them with the information they want but, with the help of lead capture, follow up and build the personal connection quickly before another agent does. The good news for you is that it’s not all that hard to do. Many agents don’t understand the importance of reaching out right away but they are missing out on potential deals down the road. Consider this, 70% of consumers choose their agent based on the first person to provide them with relevant content. Now that you have the lead capture information, you need to become a one-stop shop for all their needs. If they must go elsewhere online to find additional listings or educational content, your chance of losing them to another agent increases. This all goes back to understanding their behavior patterns on your website. Send them exactly what they are looking for based on behavior triggers. When you see any of these consumer behaviors take place, you have yet another reason to reach out, remind your lead that you are their go-to for their home search, and that you’ll be with them each step of the way! Ready to start 2018 off with your own intelligent web design and lead capture? These are just 2 of the many features PropertyPulse has to offer. Contact us today for your FREE no-obligation demo. We have customized packages available to fit nearly any budget.